Christ Church will be offering a Soup & Scripture program during Lent starting Wednesday, February 20th at 5:30pm. This year's program will be lead by Jerry Aaker and will he will be working from his recently published book, The Spirituality of Service. If you're interested in joining the program, please come as you are. You don't need to bring anything. A light soup supper will be provided. All are welcome. Who will win the Golden Halo? It's a fun way to learn about and be inspired by the lives of the saints. Click here to learn about the contest. You can play every day, voting for your favorite saint. If you fall behind, all the records are on the website, so you can catch up on the competition. It looks like there will be some heated match-ups this year! 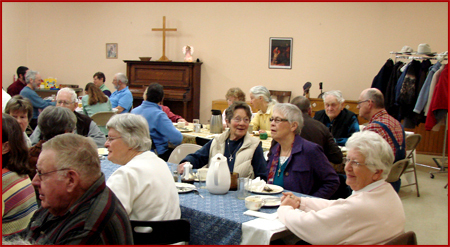 the Lenten journey and bringing our community together in fellowship. 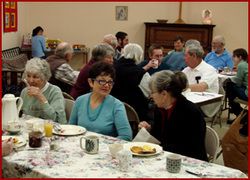 St. Mary's Catholic Church in Laurin will hold a Stations of the Cross service every Friday at 5:30pm during Lent. All are welcome to join.